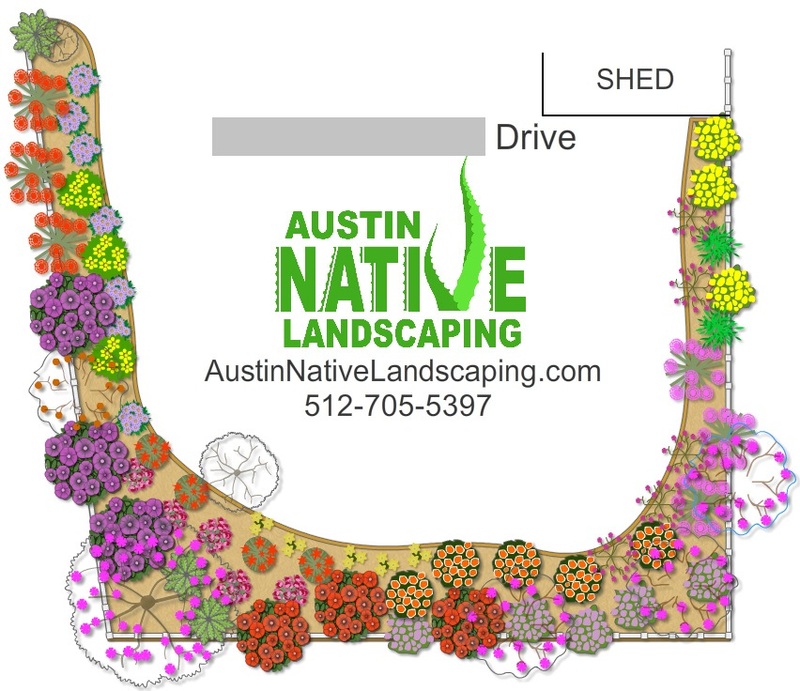 Austin Native Landscaping > Austin Native Landscaping Blog > Drought Tolerant Back Yard Xeriscape Landscape Design Explained! Drought Tolerant Back Yard Xeriscape Landscape Design Explained! Here is a design for a back yard that was recently commissioned from us. The couple is thinking about flipping the house in a few years, and what better way to increase real estate value than installing a killer drought resistant Texas native Xeriscape landscape? About the property; the back is sodded with a relatively healthy lawn (increasingly rare these days!). There are a few existing small trees but the area overall is definitely full sun. The owners have beloved pets and did not want to go the prickly agave route. The clients love color and plenty of it. I believe we delivered in that area. There are 18 different plant varieties! All plant sizes in the design represent average width in maturity. All are perennials. We plant most of our plantings with a one gallon size. Maturity to be achieved anywhere between 2-4 years. (Except trees of course). 2. Texas Mountain Laurel. This is a no brainer choice, really. This tree is extremely drought resistant and will survive most conditions. It thrives in the sun and is an excellent choice for most backyards. Texas Mountain Laurel can be shaped to a formal tree form or left alone for a more wooly and privacy inducing shrub. Yes, it grows pretty slow and is not a candidate for shade providing but the blooms are outstanding and the aroma is mesmerizing. Best of all? It’s an evergreen. 3. Pomegranate. We use exclusively edible varieties as we find the ornamental ones an odd choice when you can have a food producing tree with the same requirements. Have y’all seen how much they sell pomegranates at the store for?! Be the hero of your neighborhood with this healthy and juicy treat producing factory. Eat them, Juice them, Give them to kids, Throw them at intruders (The perpetrator should be easily identified by the red and stained mess on his back). Eating pomegranates can be quite a production and is often quite the poetry in motion, almost a zen like state; They are staining, sticky, and the seeds are well jammed in its flesh. It makes more sense to juice them once you have a bunch of pomegranates readily dangling in your back yard. Regarding juicing; We had great experience using a regular heavy duty citrus juicer, like this one. Just cut them in half, squeeze em and repeat. But don’t tell Pom about it. Fun fact: Pomegranates are one of my favorite fruits and plants. 4. Desert Willows are a great Xeriscape tree. The blooms are beautiful and abundant and its smallish stature makes it a great option in plenty of situations. 5. Bottlebrush is an awesome pick. This flowering evergreen is an excellent choice in the back of your landscape. Its large stature is an advantage near fences or unsightly sights. 6. Rosemary. A great evergreen that loves the sun, provides the occasional herbage, and balances out its more colorful and rowdy plant neighbors. 7. Texas Sage. There are scraggly and spindly Texas sages, and there are beautiful, full and huge specimens. A well established Cenizo is quite a site when in bloom. Also an evergreen which makes it an excellent candidate in background and fence plantings. 8. Trailing Lantana. Trailing lantana is an awesome choice for low water plantings! Its trailing nature is much appreciated in plenty of Xeriscape design situations. Long blooming, low water and maintenance; Perfect. 9. Texas Lantana. There are many Lantanas you can design with. Plenty of colors and heights. I use Texas Lantana as its water requirements are even lower than the hybrid types. 10. Golden Showers Thryallis. Clients like the color Yellow and Yellow is what Thryallis does best! Long blooming period, low water requirements and an evergreen. Folks should start using Golden Showers more often as I feel it’s an underutilized plant overall in Austin. 11. Skyflower. This is probably the least drought resistant of all the plants so far. But its potential size and abundant bold purple blooms make up for it. A healthy unpruned Duranta can turn to be a 10’ by 10’ mammoth! 12. Pride Of Barbados. Easy pick of course as its show stopping blooms complement most Xeriscape landscape designs. Most folks are quite proud of their Pride Of Barbados and so will you! 13. Pink Skullcap. I use tons of this multipurpose plant in our Xeriscape Designs. Why you ask? Well, its an evergreen that is very tidy and adorable in nature. Its masses of tiny red flowers will surly win you over. Pink Skullcap’s low height allows us to use it plenty in the front layers of Xeriscape installations in Austin. 14. Mexican Bush Sage. There are a few plants that will grace you with an explosion of purple blooms in the fall, Mexican Bush sage (and Fall Aster) does. Mexican Bush Sage is very hardy and will just require the occasional trimming down after frost. 15. Jerusalem Sage. Another great sage that I highly recommend to clients in Austin. Its an evergreen and showers the landscape with bold large yellow blooms in the spring. The foliage is quite unique and pleasant to look at and touch. 16. Bamboo Muhly. I love using ornamental grasses in our Austin Xeriscape landscape designs and Bamboo Muhly is probably one of my favorite ones. It is very graceful and can be left uncut during the winter as the dead foliage is pleasantly colored and provides interest throughout the winter. 17. Fall Aster. Once again, depending on vigor and health this plant can be spindly and kinda meh or a tidy and beautiful mound of purple extravaganza. I have seen single Fall Asters with hundreds of attractive purple blooms when there is little other landscape interest in the fall. Highly recommended. 18. Black Eyed Susan. Good ole “Goldstrum”. It is a drought tolerant and beautiful flower, although the more you water this one the more blooms it will bestow upon you. Other good choices are Blackfoot Daisy, and Purple Coneflower. Good pick for front Xeriscape landscapes installations. 19. Cherry Sage. Last and certainly not least, Autumn sage is a solid pick for any and all Texas native plants landscapes. It offers a mind blowing package: Evergreen, extra long blooming season all the way from spring to frost, drought resistant, comes in many different colors, super deer resistant and at a recent humming bird flock convention it was named as the best nectar to pair with cheese and fish (I jest…). We use the best Texas native soil one can purchase in the Central Texas area and plenty of it. We always try to install at least 3” of soil topped with at least 1” of decomposed granite. Yes, Texas natives are hardy and will survive without amending the soil. But we are not looking at mere survival. We desire an explosion of vigorous and lush growth followed by tremendous amounts of blooms. It’s funny to skimp on a few inches of soil when you drop a few grand on a landscape installation. Aside of growing vigor, excellent and Texas native appropriate soil directly affects drought resistance. The soil acts as a water reservoir that absorbs more water during rain and watering, allowing the plant to root deep for their search for moisture. Much more goodies will come in a few weeks time. So stay tuned and stop by soon! Thanks for reading and happy Texas Xeriscaping! Enjoyed the read? Be a Comet – Leave a comment! Previous: Previous post: Trailing Lantana (Lantana montevidensis) Plant Profile! Next: Next post: Lion’s Tail (Leonotis leonurus) Plant Profile!